The sound of dripping water can be heard in a small room and a man who wears casual clothes and an old woman who wears an apron are working to make special paper. They rinse out materials from the water which includes a paste made from plant extracts. This is the way Tosawashi has been made for ages. They make many kinds of special paper but it takes so much time. To make, or “pull”, a piece of paper, the whole process is repeated 300 to 350 times. Kochi has traditional paper called “Tosawashi”. 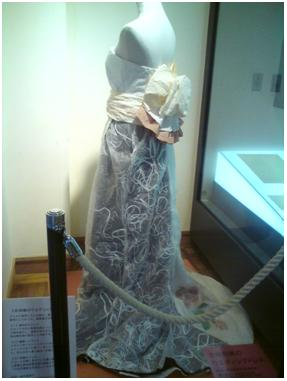 At the museum of Tosawashi, there is an artisan who makes Tosawashi by hand. He said, “Koch is an important place for making paper because there are many good points for making it.” Making paper might be much harder work than most people imagine. Even now, Kochi is a famous and major source in Japan of washi (after the Meiji restoration Tosa-han became Kochi prefecture). Kochi is suitable for making paper because its special features. Making Tosawashi needs clean water. Fortunately, Kochi has large and clean rivers. For example, “Shimanto-river” is the last river that doesn’t have any pollution. Also, it’s called that “One of the clear stream”. What’s more, Kochi has another clean river called “Niyodo-river”. This has also clean water and the 4th cleanest river in Japan. This is the one of the reasons that Kochi is famous for the paper because making or pulling paper absolutely needs clean water. Also, making paper needs some kinds of artisans. So, Kochi has some important people who make the molds for paper-making, farmers who make plants which become pulp for paper, and people who make paper. To be an artisan to make paper takes three years to become an expert of paper pulling. These people are also important for Kochi. The artisan said “These people get together, and then we can start to make a piece of paper.” So, these people are essential for making paper. 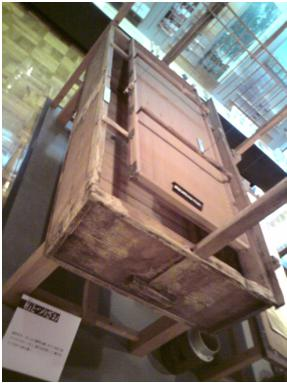 Tosawashi is so important that it was given to the Japanese Emperor as a present. So, there are many reasons why Tosawashi is important. However, recently, artisans and factories have been decreasing and this problem is related to several issues including the use of machines. As a result, washi isn’t needed except for special occasions. An artisan said, “Tosawashi is expensive and people don’t often buy so it’s not needed and many important supporting crafts—such as growing the materials and building the papermaking frames–have fallen by the wayside.” Also, the use of plastics, glass, and vinyl has increased. This means that these things take the place of washi. The history of Tosawashi dates back to 610 A.D. in Japan when it was recorded, “the paper making country Tosa” on Tosanikki in Heian era. Akisaburozaemonietomo made a washi which had 7 colors (this was the first paper which had colors) and Kochi was active to make it. In addition, Yoshii Genta is an important person to make Kochi famous for paper because he began to create some new kinds of paper and spread all of Japan. The artisan said, “Kochi has many kinds of washi. In contrast, other countries which are famous for making washi don’t have the varieties. 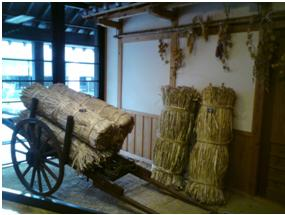 This is the feature of Tosawashi.” For example, it’s used for shoji, kakejiku, husuma, calligraphy, and arts. Furthermore, Kochi has produced some special thin washi, such as Tosatenguchoshi tracing-paper. Tosawashi is made from the trees called, Kozo (Borussonetia kazinoki × B. papyrifera), Mitsumata (Edgeworthia crysantha), and Ganpi (Dipromolpha shikokiana). There are suitable and unsuitable what kinds of paper you want to pull. These raw materials are boiled with alkalinity solution. And then, these are washed to remove impurities. These materials are hit by sticks. They are immersed in a pool of water. This action decides the quality of paper so this is important. And it is mixed with mucilage by using a stick. These processes are to make material of the paper. Visitors can make a small size sample paper like postcards by hand but usually cannot make a real size of paper whose length is 2-shaku and breadth is 3-shaku. However, I had a chance to make Tosawashi for real, and was surprised at how much strength is needed. It’s hard to believe that these processes are repeated from 300 times to 350 times, which is what is required for the proper thickness of Tosawashi. “Kochi is rich in natural sources of materials, tools, and weather so it continues even now.” said an artisan. This is Kochi’s original and precious tradition. Kochi has great artisans who make molds which are required for making or pulling Tosawashi. This is worth continuing. It can be said that “Kochi is the paper making kingdom”. This article turned out so well. You really did a good job and wrote an interesting piece. It makes me want to pull paper again! Great article about Tosa washi. 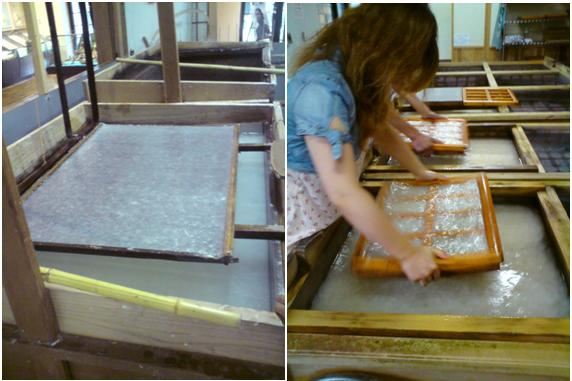 When I first came to Japan (a long time ago …) I went to Ino and made some paper. It was a lot of fun. It was good to read about the history in your article. I really enjoyed it. My ゼミ student who finished last year, his parents have a washi workshop up in the mountains above Susaki in a place called Yusuhara. My student gave me some as a present – the paper is very coarse-textured but artistic too.